The dock at the north end of Prospect Lake. Watch the trees of the surrounding forest glide by as you swim through clean, crisp water on a hot summer’s day. Enjoy a communal beach atmosphere, or find your own quiet nook. Take a picnic with you, and take a nap under the sun while you dry off. 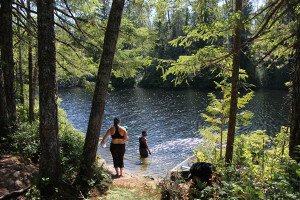 Swimming at Peden Lake in the Sooke Hills. 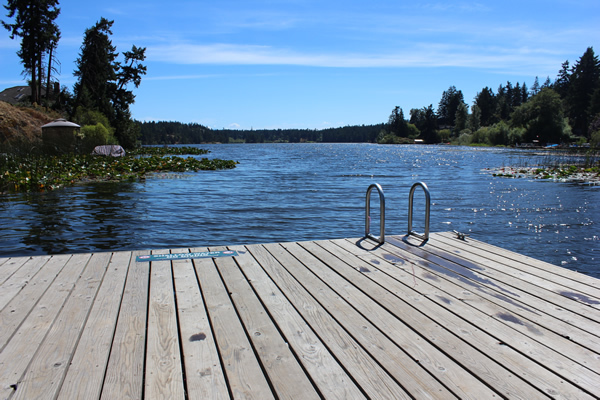 From the hidden log at Blinkhorn Lake in Metchosin, to the warm waters of Durrance Lake in the Highlands to the quiet, still waters of Peden Lake tucked away in the Sooke Hills, southern Vancouver Island is an amazing place for people who like swimming outside. With so many lakes to choose from, you don’t have to go very far to find an awesome place to take a dip. 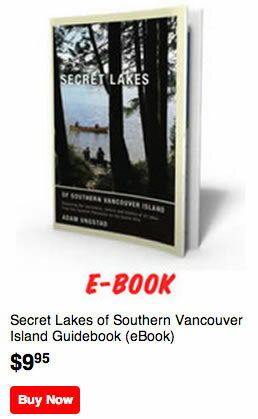 The Secret Lakes of Southern Vancouver Island Guidebook is the best book available for swimming spots in Victoria, Saanich and Sooke.